Foey, our 1 year old plus hamster is making her rare appearance today! 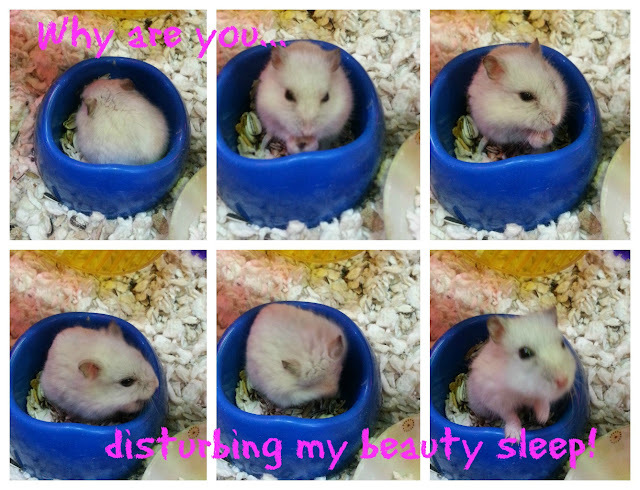 This fat little round white ball of thing was having a snooze in her food dish when I decided to whip out my Samsung SIII and start snapping away. Above photos are taken with my Samsung SIII mobile phone camera with NO editing done, I am extremely pleased with the photo's quality, its clear (not grainy) and sharp. Shuttle speed is fast to capture the split second freeze moment of Foey. Cute little furball.. I have yet to allow my kids to keep pets at home. Z must be loving his pet. Yupe love her to bits. Awww!!! She is sooooo cute! She reminds me of Snowball, our pet hamster who is now in hamster heaven. I've had too many hamsters in my adult life to remember their names haha~ This is DinoBoy's 2nd hamster though and I think more to come when Foey is over at the other side of the rainbow. It was in the room coz I was not sure if some of the parents mind to have a furry thing in the dinning area or not. eh... her name was the first word in my post.... anyway its Foey. Don't ask me why its spell this way coz DinoBoy insisted on this when we got her. We had 2 hamsters before. A female named Muffin and male named Pocky. hahaha! And well done with the photos! It's difficult to take pic of hamsters.